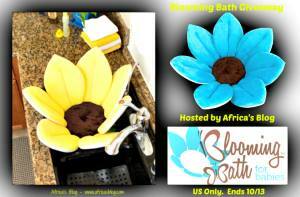 Powered by Mom Blog shares the Blooming Bath – for babies Guest Giveaway!! Blooming Bath – making bath time, for your infant, fun and SAFE!!! The amount of space in the sink to give your little one a bath is just right, and sure is a blessing on your knees because you don’t have to sit next to the tub while giving our little one a bath, same thing goes for your back, no bending down so low to pick up your little one from the tub. Blooming Bath is also really cute and once you’re done with bath time, simply squeeze out the extra water and drop it in the drier, or you can hang it up in your shower/tub, it really couldn’t be easier. The Blooming Bath comes in canary yellow, turquoise, hot pink, and ivory, a color for all genders and gender neutral. This definitely makes those sink baths much easier AND safer!! The Blooming Bath is soft and super squishy, so it keeps your little one safe from getting hurt when they squirm as they have fun at bath time!! A complete hit a baby showers! Will be the talk of your next baby event!! Blooming Bath can be purchased, for $39.99 at all 90+ buybuyBaby stores, Target.com, as well as over 100 other boutique retailers across the country and Canada. You can locate your nearest Blooming Bath retailer by clicking here. While you’re checking out the Blooming Bath website, also make sure you follow their Facebook, Pinterest and Twitter pages – that way you will stay up to date with everything related to this amazing company and awesome product!! Now you can enter to WIN a Blooming Bath for your little one, or as a gift for someone expecting. Enter on the rafflecopter entry form below. Open to US entries, 18+ only. Ends October 14th at 11:59pm EST. Good Luck & Happy Bath Time!! I’d choose canary yellow. Thanks. I would pick the yellow one. I would choose the Canary Yellow color. I would like the Hot Pink one. Want a great idea. Id pick pink or yellow so it can be gender free. I’d choose the Hot Pink. These are adorable! Love the Canary Yellow, such a happy color! Hot pink for my little lady due in january. I would choose the yellow! I would select the Canary Yellow. I would pick either the hot pink or the turquoise. I would love the turquoise Blooming Bath. I’d pick the blue one.